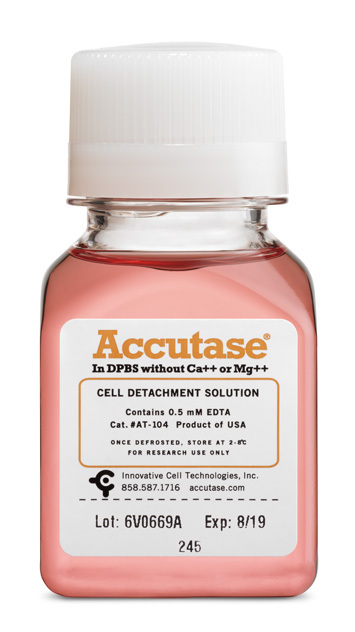 Accutase® Cell Detachment Solution | Product Details | ICT - Innovative Cell Technologies, Inc.
Semper Lenis "Always Gentle" reattachment of neuronal stem cells passaged with Accutase. "I like that Accutase is gentle on cells and auto-inhibits at 37°C without the need for a neutralizing solution like with trypsin. Also, the cost of Accutase is less than trypsin + trypsin neutralizing solution, so it is cost-effective. It is also simpler to use, because it doesn't require the extra neutralizing step, I just lift my cells in Accutase, then add them directly into fresh media. I believe everyone in my lab now uses Accutase. We work with a wide range of cancer cells and neuronal cells too, and it works great." Accutase is a natural enzyme mixture with proteolytic and collagenolytic enzyme activity. This means it mimics the action of trypsin and collagenase at the same time. However, because it is more efficient than mammalian trypsin & collagenase, it is formulated at a much lower concentration making it less toxic and gentler, but just as effective. Can be used whenever gentle and efficient detachment of any adherent cell line is needed. Accutase is a direct replacement for trypsin. Works extremely well on embryonic and neuronal stem cells; mono layers of stem cells can be grown after passaging with Accutase. Preserves most epitopes for subsequent flow cytometry analysis. Does not need to be neutralized when passaging adherent cells. The addition of more media after the cells are split dilutes Accutase so it is no longer able to detach cells. Does not need to be aliquoted. A bottle is stable in the refrigerator for 2 months. cells, and Sf9 insect cells. hESC culturing, analysis of cell surface markers, virus growth assay, quiescence assays by serum starvation, transformation assays by oncogene transfection, neural crest cell migration assays, cell proliferation, apoptosis, cell haptotaxsis, tumor cell migration assays, routine cell passage, production scale-up (bioreactor), and flow cytometry. Human MG63 Fibrosarcoma cells cultured in DMEM + 10% FBS were treated with Accutase. Treatment resulted in rapid cell detachment, a single cell suspension, and high viability. Accutase is gentle on cells; viability was 97 ± 3% even after 45 minutes in Accutase. Subscribe to our mailing list for discounts on Accutase & Accumax!